With the Southwest Florida housing market in full recovery mode, home buyers are looking for the “next Lakewood Ranch” in Bradenton. There is no question that Lakewood Ranch is one of the best places to live in Florida, but that master-planned development can no longer expand to accommodate the demand, which has resulted in rising property prices. One good alternative to Lakewood Ranch has been undergoing development since 2015. Award-winning home builder Neal Communities, known for some of the most attractive villages in Lakewood Ranch, has been developing Eagle Trace in Bradenton since 2013, and this neighborhood has really caught the attention of home buyers and real estate professionals. Located near the northeastern corner of Lakewood Ranch, Eagle Trace is a 104-acre community that has been parceled to accommodate more than 270 homes and a six-acre nature preserve. Neal Communities has designed Eagle Trace to compete against the most attractive villages of Lakewood Ranch. To this effect, two of the floor plans offered by the home builder have already been honored with the Parade of Homes award for two consecutive years. Eagle Trace will equally appeal to single professionals, families, senior homeowners, seasonal residents, and property investors. There are single-family residences and maintenance-free villas to choose from; they feature two to four bedrooms in floor plans that start at 1,434 square feet of living space. The architectural design is a modern variation on the Mediterranean style, and the home models are extremely attractive. In the summer of 2015, pricing at Eagle Trace started at $262K, but property values were rising rather quickly. Families will certainly enjoy the various amenities at Eagle Trace; they include: nature trails, a dog park, tennis courts, a playground, a recreation center, and a swimming pool. The location is also perfect for seasonal residents; a large shopping district is located just beyond the Eagle Trace gate, and Holmes Beach is about half an hour away. 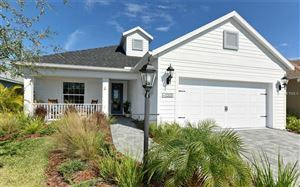 See all Eagle Trace Bradenton Florida Homes for Sale.